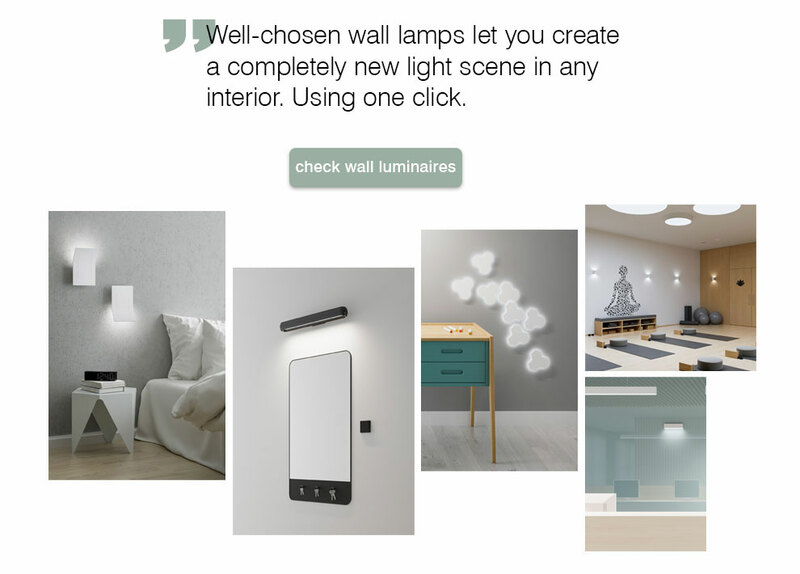 What kind of luminaire to choose when creating an atmosphere with wall lighting? If you compare the lighting design to a film set, general lighting plays the leading role. It is often placed centrally in the interior, has bigger size or more spectacular forms. Wall lamps are just like supporting actors. They mostly complete the picture, yet in some scenes they can even overshadow the leading stars. General lighting will not guarantee the climate that can be provided by properly selected wall lamps. Imagine a late afternoon, when you come home after a hard day's work. Instead of the computer, you hold a cup of warm tea, the noise of the office turns into a pleasant jazz. Time to relax. The quality of your relaxation depends not only on what you do, but also on the conditions which surround you. It is usually nicer to rest in a light semi-darkness, than in a room flooded with strong light, which is more suitable for active work. 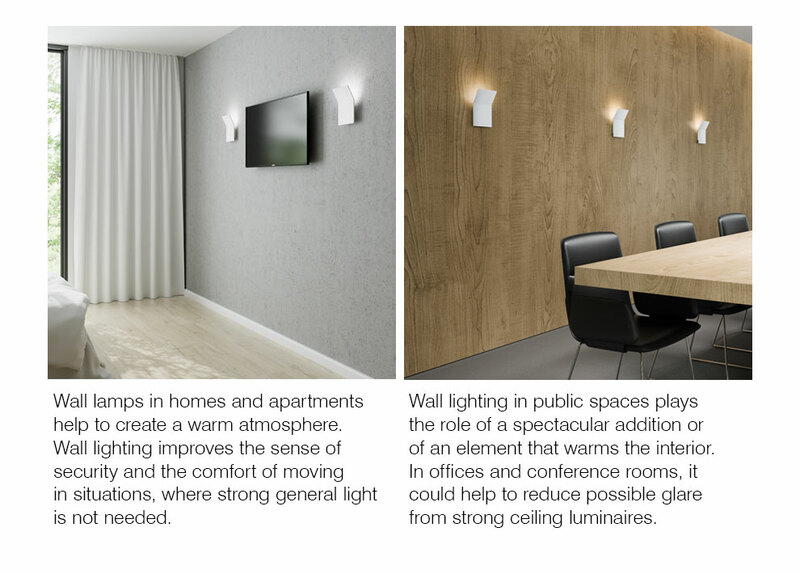 The atmosphere, sense of security and comfort of movement will easily be provided by wall lighting. When to use wall lamps? Wall lamps are special lamps. In most cases, the luminaire is directed towards the highlighted object or the workplace, which requires appropriate intensity of light. However, there are exceptions - not all light is designed for work or exhibition purpose. In rooms where we want to create a pleasant atmosphere to calm down, one of the best solutions is to use a bright background. Warm light flowing around the wall does not distract attention and allows the eyes to rest. Wall lighting also works well as a complement to the effective interiors of restaurants and hotels. LED wall luminaires with an ‘up-down direction’ can create interesting lighting patterns, as if breaking the wall surface. This solution works well both on smooth surfaces where light plays the leading role and on the walls with structure - here the light emphasizes three-dimensionality. We should also not forget about offices and conference rooms. There, the side lighting helps to warm the atmosphere and reduce possible glare from the highly-luminous ceiling luminaires. When light is used for the aesthetic purpose, it requires appropriate fixture. The form should be elegant, but not raw. Functionality is important, but should not dominant the style. In this context, glass lamps are a particularly interesting solution. A few reflections of light on a hand-made lampshade creates an amazing effect. 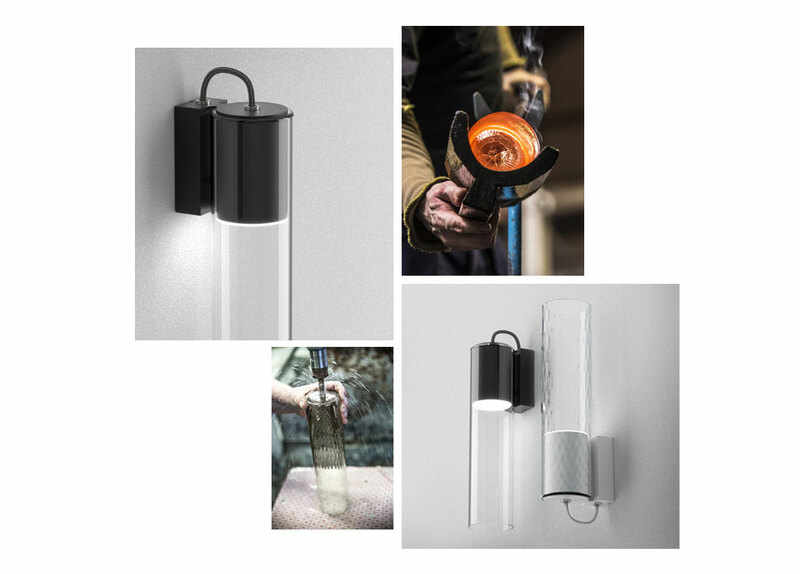 A good example is MODERN GLASS - wall lamp, whose hand-crafted glass cover is filled with LED technology. It is an elegant and functional addition to any interior that wants to be both modern and yet romantic. 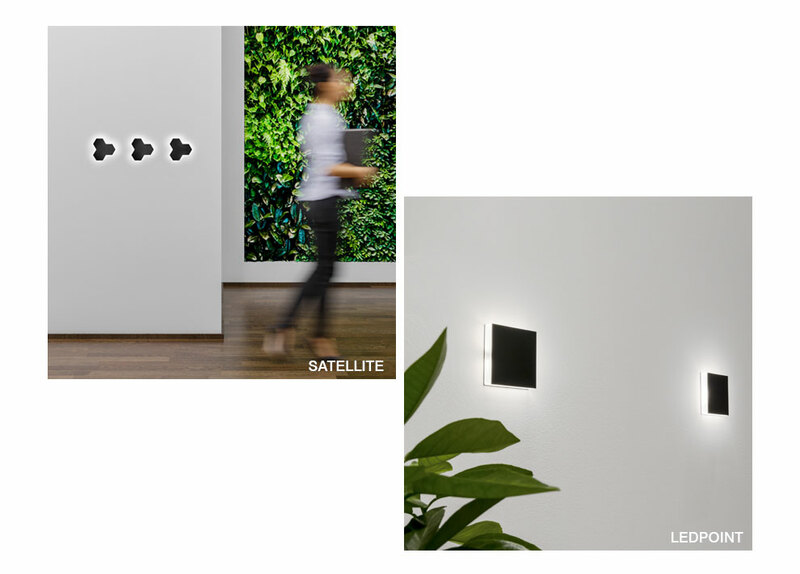 Since light is the first ting human eye recognizes, wall lamps can be successfully used to emphasize communication zones in a building. Glowing objects attract our attention like a magnet. This fact can be used for example, by setting a light direction. Wall luminaires like SATELLITE and LEDPOINT are great for this task. It is easy to arrange them in larger compositions, place along a corridor or staircase. They will facilitate movement without reducing space, due to their compact size. Another option where side light can be used is to mark the edge of the step. Thanks to the backlight, it is easier to navigate the staircase, not to mention having the better visual effect. 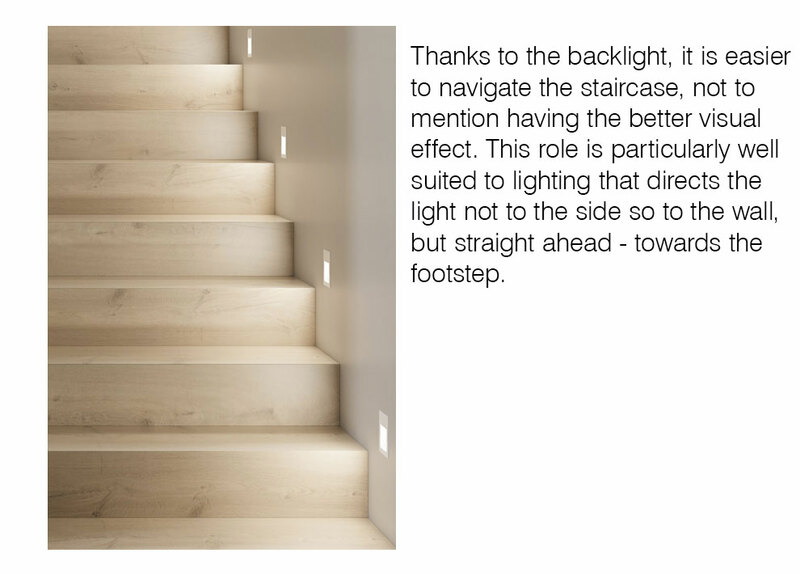 This role is particularly well suited to lighting that directs the light not to the side so to the wall, but straight ahead - towards the footstep. In a modern interior, you sometimes need a distinctive element that breaks the peculiar monotony. In the traditional one - often needs a detail entering into a dialogue with the classics. Here wall lamps with expressive forms work well. A good example is GRAPH. Drawn with a sharp line GRAPH shines in up and down directions. By day, the very form of this luminaire is an intriguing addition to the interior. However, sharp edges reveal their function after dark: it is then visible that this wall lamp’s light gently floats on the wall towards the place it is directed to, while the border between light and dark remains clear. 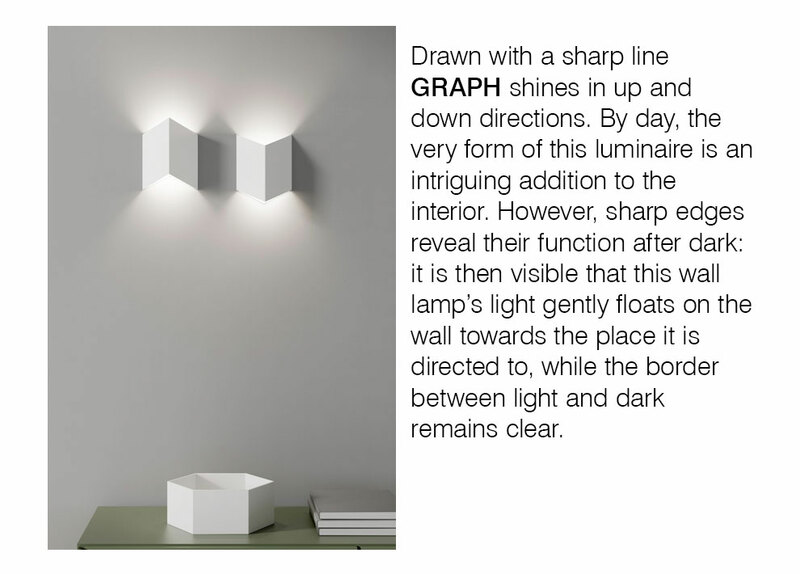 Thanks to this, GRAPH will extract a decorative wall texture or create a distinctive light pattern on it. Home, but not only home. Emphasizing the texture of the wall through a lighting solution, decorating the interior and creating a mood with light is needed in many areas. 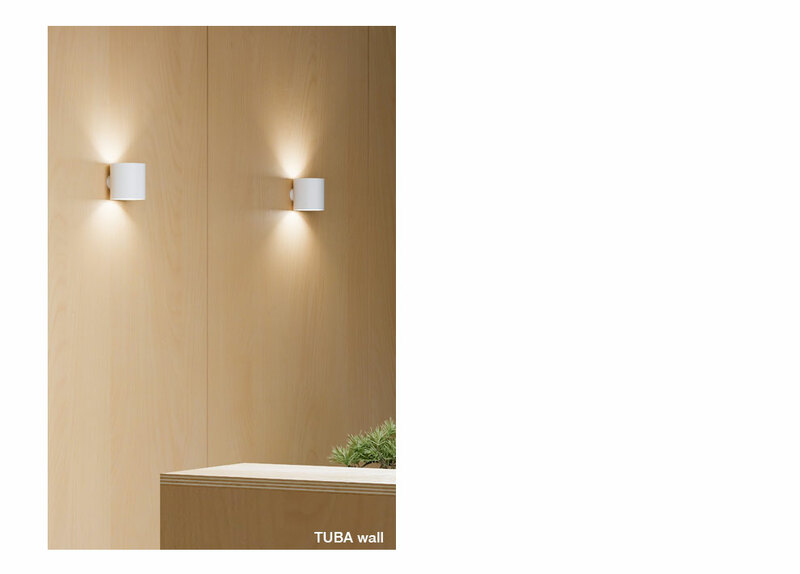 Wall luminaires are an indispensable addition to restaurant rooms, hotel corridors and relaxation zones in offices. They make the waiting rooms of doctor's offices a bit more pleasant. Well-chosen wall lamps let you create a completely new light scene in any interior. Using one click.